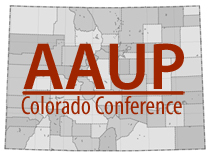 The agenda for the Colorado-AAUP Annual Meeting on December 3, 2011 has been announced. The meeting begins promptly at 9:00 AM in Room 247 of the University Memorial Center (UMC), University of Colorado, Boulder. Details about our guest speakers–State Representative Randy Fischer and National AAUP Council Member Marc Bousquet–can be found in earlier blog posts. The UMC is on the corner of Broadway and Euclid and the parking structure next to the UMC is the most convenient place to park. A campus map may be found here: http://www.colorado.edu/campusmap/. 9:00 Randy Fischer, Colorado State Representative: Legislation protecting contingent faculty rights. Open Forum: Contingent faculty issues. Colorado Committee for the Protection of Faculty Rights: Reports and Cases. Individual Chapter Updates and Reports. 12:00 Luncheon Keynote Address: Marc Bousquet, National AAUP Council Member.